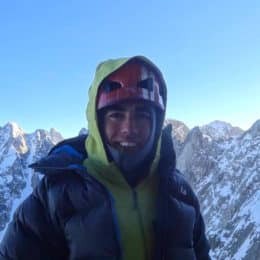 Improve your technical skills with this 2-day ice climbing course led by IFMGA-certified mountain guide Robin. 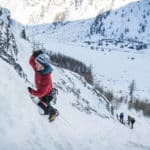 Dare join me on this course and experience the joys that ice climbing has to offer! 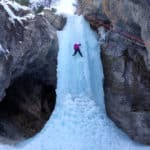 Ice climbing refers to the roped climbing of waterfalls and ice gullies. It is a quite rare but thrilling activity! 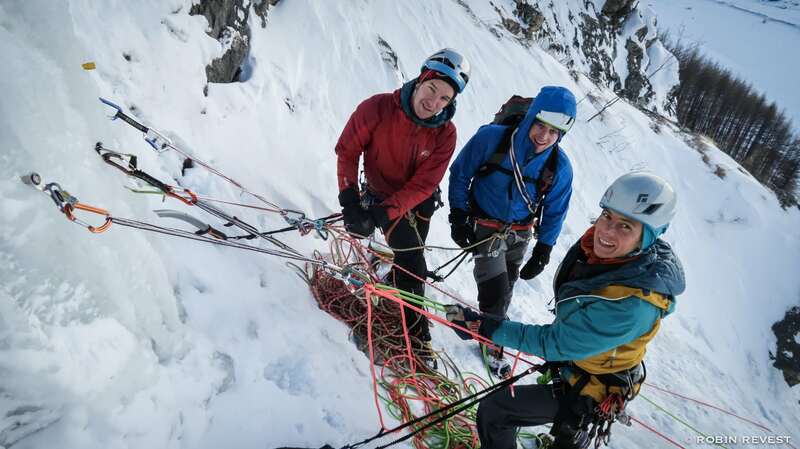 This 2-day course is designed for those who already have some ice climbing or rock climbing experience and seek to improve their technical skills. We’ll visit the most beautiful spots in the Ecrins, where you’ll get to test your skills in the most stunning surroundings. Although I usually organize these courses in the Ecrins area, I can also conduct them in Chamonix or Cogne. So just let me know what works best for you! 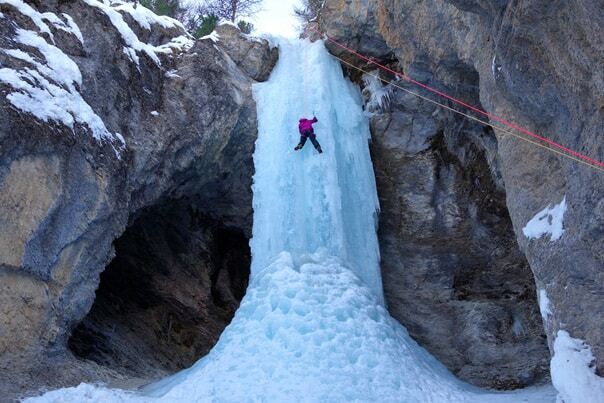 Depending on your goals, we will focus on different aspects of ice climbing. We could concentrate on climbing signals, review security basics or introduce autonomy. Hence, with this 2-day intensive course, you’ll see yourself take an important leap forward! To fully profit from this course, you need to be in a very good physical condition. A minimum of 2 and a maximum of 3 people can take this course together. This is both for security reasons and for all of you to take advantage of the learning experience. If you haven’t got any ice climbing experience, my ice climbing initiation day could be the best option for you. Be sure to check it out! 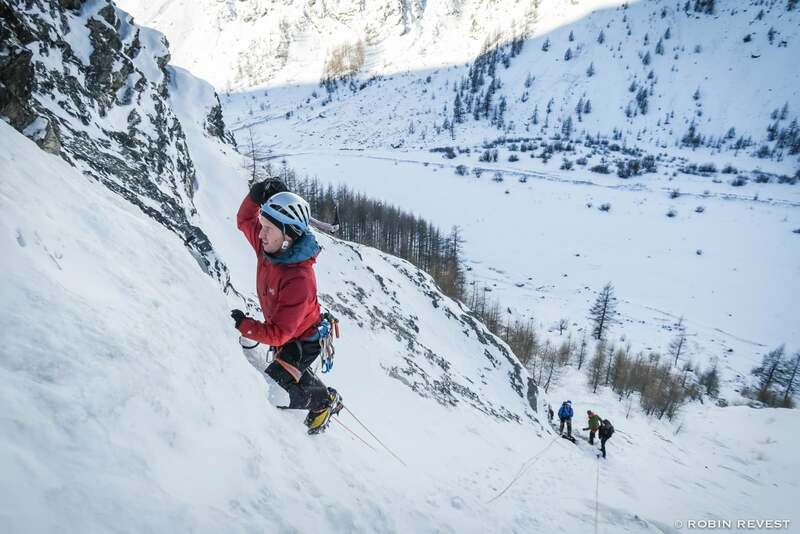 Contact me to learn more about this 2-day ice climbing course in the Ecrins. 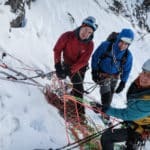 I can guarantee an amazing experience and an extremely fun two days in the company of a professional mountain guide! Apart from the guiding fee and all the necessary equipment, the price includes photos and video footage. I was born in 1990 and I am based in Toulon. I am a high mountain guide and photographer. I started loving climbing during my youth, and I later discovered alpinism. This took me to visit many paths in the Alps, as well as expeditions. At the same time, I became a high mountain guide when I was 24 because I loved it and wanted to share my passion. I like to travel and I offer my services in the French massifs (Mercantour, Hautes Alpes, Chamonix) and abroad (Switzerland, Italy) all year long. I will do my best to enrich your journey with my experience and to guide you to reach you dream summit. climbing spots, which is really nice. The weather in Verdon was not good during the trip, so we ended up climbing some beautiful routes in les Calanques and Cap Canaille. Robin knows the area and the routes well, so he selected the ones that was within my ability but also felt challenging. Robin also took a lot of nice photos along the way, introduced and explained the routes/backgrounds, and helped me feel more comfortable climbing multi-pitch routes (this was my first time). I highly recommend this trip to anyone that wants to experience the beauty of south of France from a couple hundreds meters up. since we didn’t have a car. He took us on the route de Cretes which is beautiful, and then climbed les Calanques. The day was perfect and the view was mesmerizing. At the end, he dropped us off at the city center of Cassis since we luckily had the time to visit it. I would definitely recommend the guide, who watched over us and is friendly, and the route which was so beautiful!